All ingredients come from my local Dollar Tree store for my Quick Sausage & Black Olive Pizza recipe. 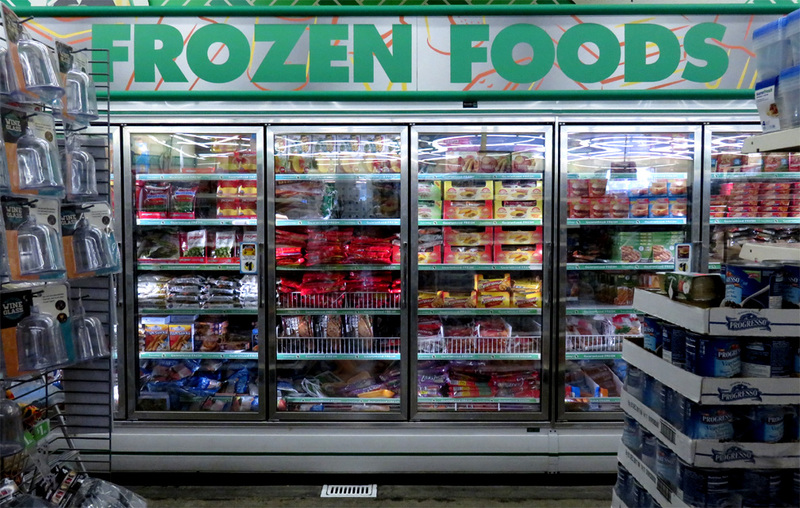 It came together quickly as I found what I needed cruising the frozen deli case and store aisles. 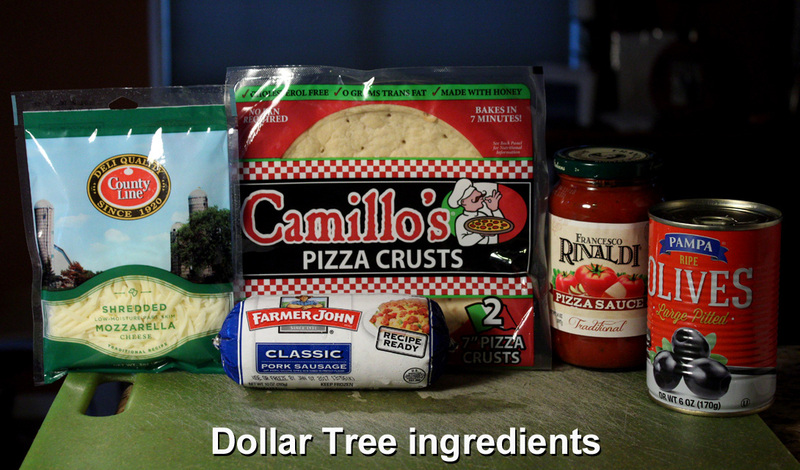 So read on to see my easy-to-make pizza recipe with tasty cheap$kate ingredients. 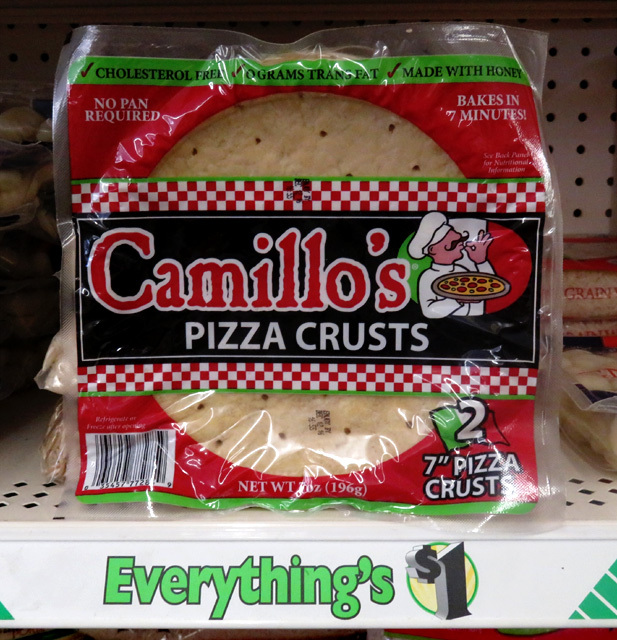 The first Dollar Tree item that caught my attention was pre-baked Camillo's Pizza Crusts. You get two 7 inch rounds for a buck! But sometimes you get what you pay for. While they are tasty, (because they are already baked) when you build the pizza and bake it, the crust dries out until it has the texture of a large cracker. Now that is fine if you like a crunchy crust. 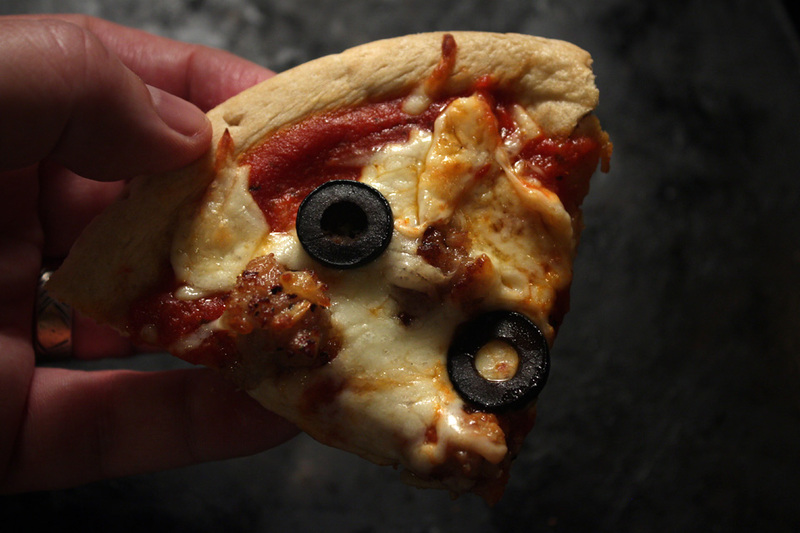 I like the outer crust hard, but prefer the rest of the crust to droop under the weight of the toppings. 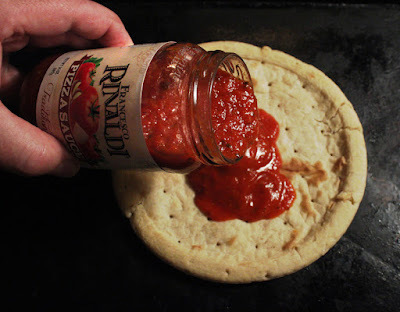 So, while the pizza crust is fine tasting, the texture is too hard. I even reduced the temperature, that the package recommended. I baked the assembled pizzas for 10 minutes as 400 degrees. But the crust held up well with the added ingredients of pizza sauce, cooked sausage, cheese and sliced olives. 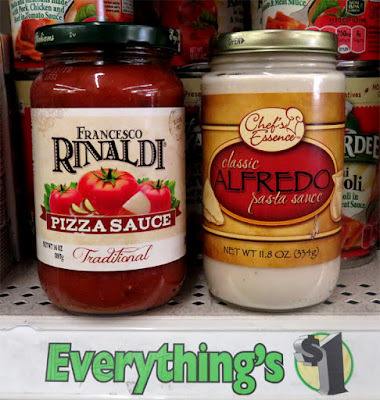 Further down the aisle with pizza crusts, I found plenty of canned tomato sauce, but lucked out and picked up a 14 ounce jar of Pizza Sauce by Francesco Rinaldi. It is quite tasty. Mainly a tomato sauce, the extra spice and herbs are a subtle addition. 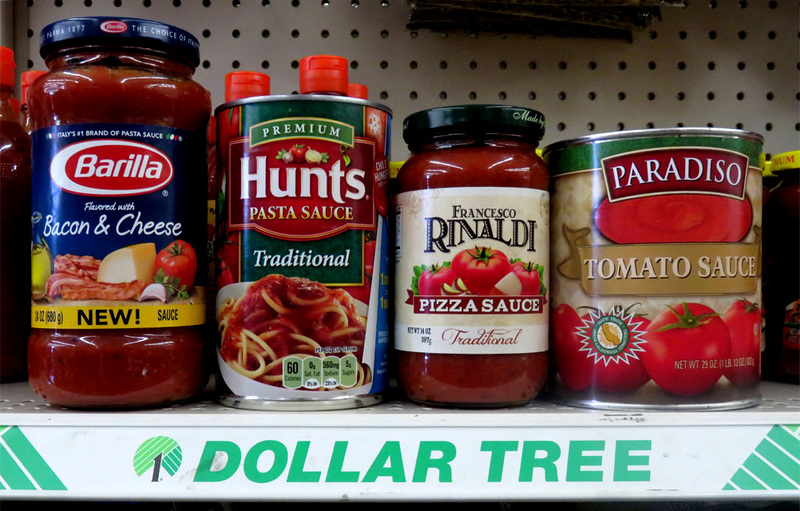 It is very much like a typical canned pasta sauce. The jar holds enough to sauce half a dozen of the 7 inch pizza rounds, so this is a deal I can get behind. I also found jars of Alfredo sauce as well, so I'll make a White Sauce Pizza next time. 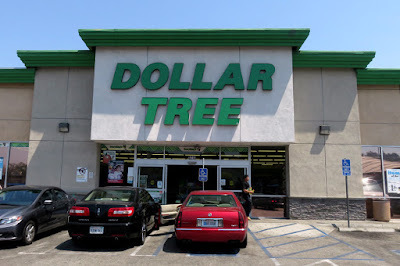 I made my way to the Dollar Tree cold deli case against the back wall. It held all the toppings I needed for a sausage pizza. They carried small packages of sliced pepperoni and a couple types of breakfast sausage, both made by Farmer John's. On type was just plain, while the other were links with maple syrup flavorings. I went for the plain Farmer John's Sausage, in a 12 ounce package. 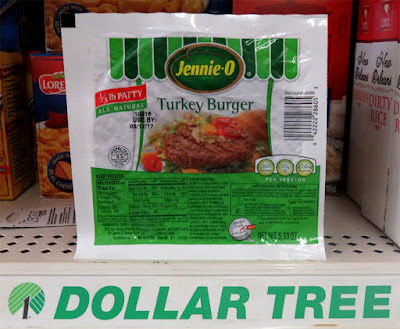 A darn good deal. I figured I would fry up the sausage with a sprinkle of dried Italian herbs like oregano and basil. Also I added a little salt and pepper to the frying sausage. 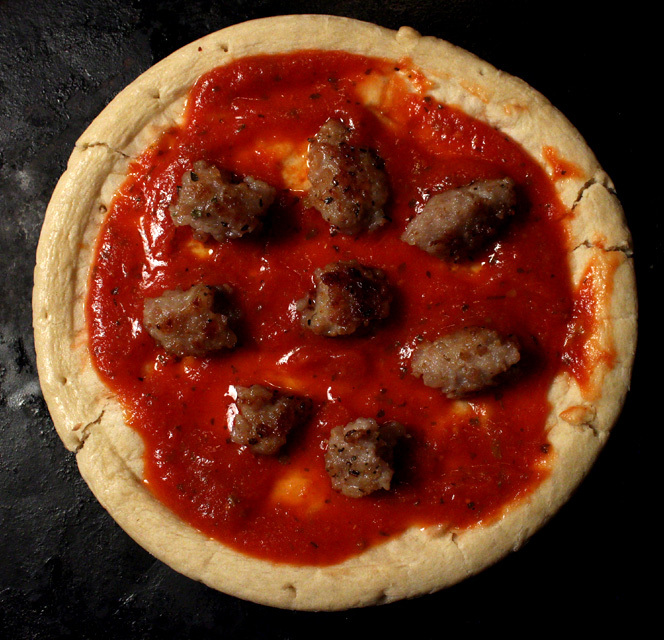 I broke up the larger pieces of sausage into bite sizes to fit as a pizza topping. 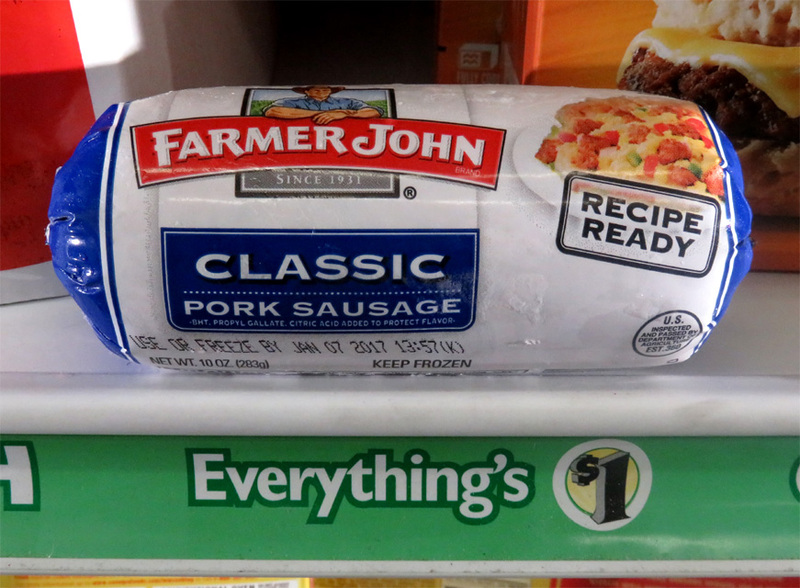 Farmer John's sausage is much fattier than regular link sausages, so be sure to drain off the grease after sauteing. And once you add some herbs, it gets close enough in flavor to a link of Italian sausage. I cooked the sausage all the way through. 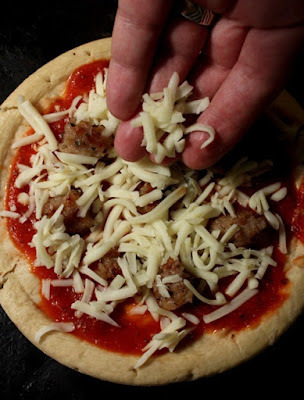 When building the pizza with pre-cooked pizza dough, all you need to do is heat it up until the cheese melts and the sausage is hot again. 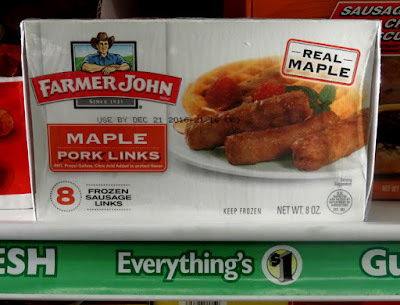 I guess I could have fried up the Maple Syrup flavored sausage, adding Italian herbs, and called it Sweet Italian Sausage. 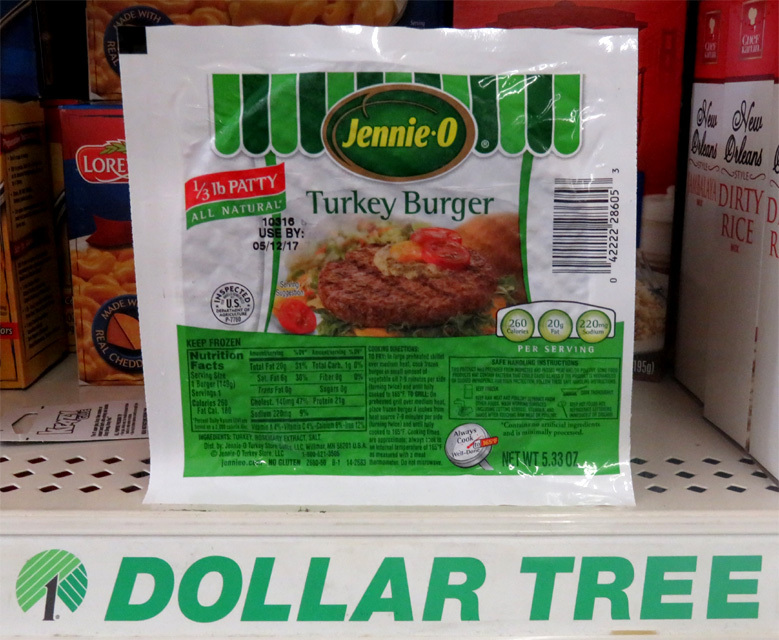 Dollar Tree also carried an individual uncooked Jennie-O Turkey Burger patty. 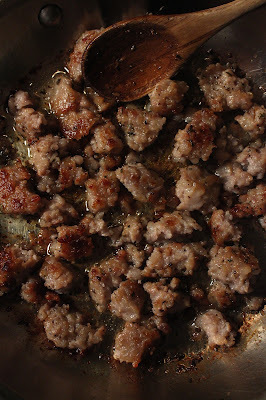 So it would have been easy to make low-fat Italian-style turkey sausage, too. 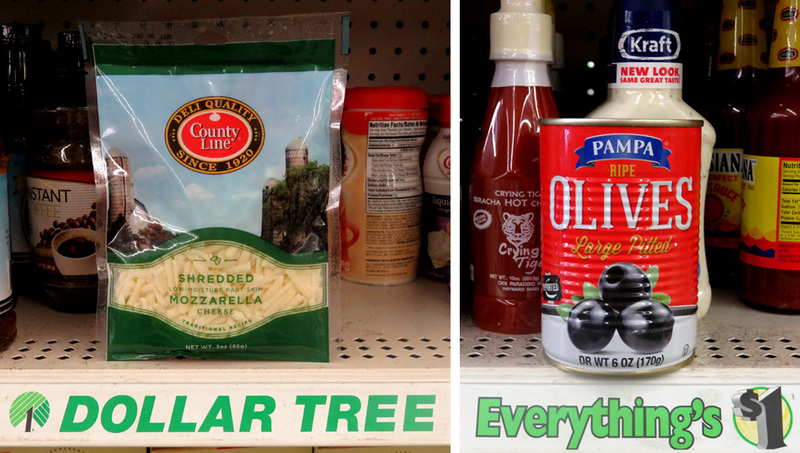 There were also small 3 ounce packages of shredded mozzerella. That's enough to take care of two small individual pizzas. 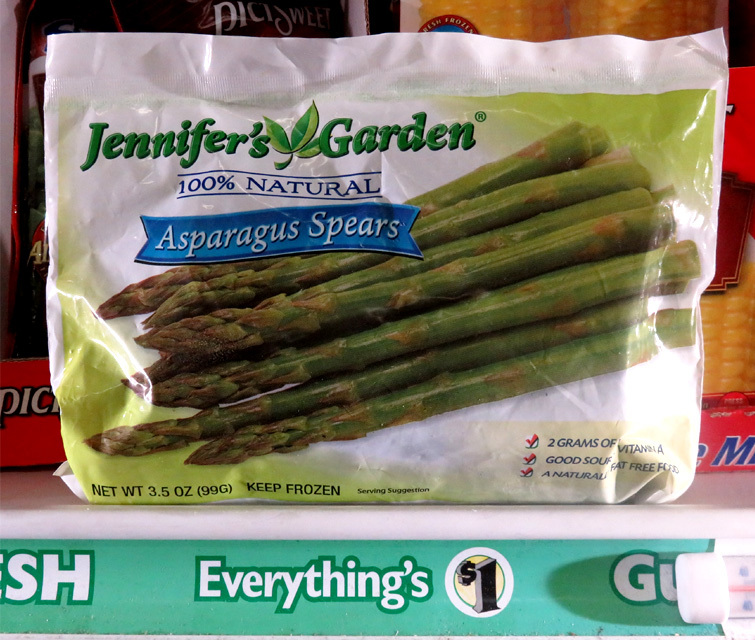 The deli case also held packages of fresh frozen vegges like asparagus and different veggie combos. 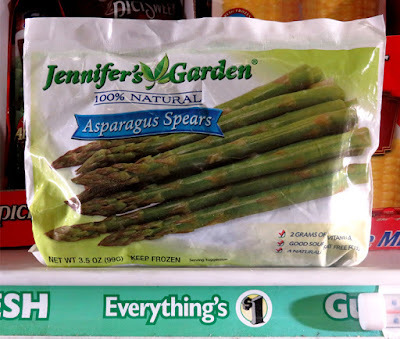 I could have added a couple of asparagus spears, or just made a veggie pizza. 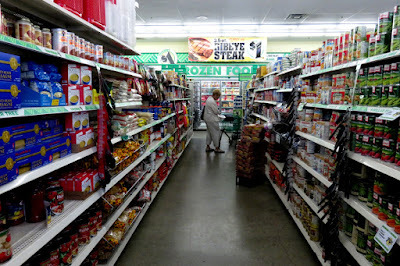 And one aisle over they had cans of black olives and jars of roasted red peppers. 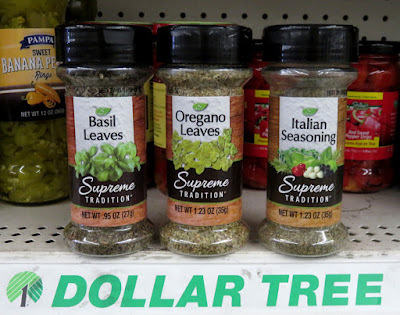 I got the olives, but next time I would try the marinated peppers. I like to thinly slice black olives as a pizza topping. 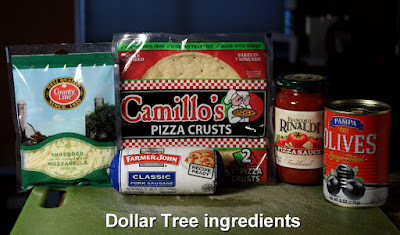 So for about 6 bucks I got enough Dollar Tree ingredients to make 4 individual pizzas (adding dried herbs I have at home,) with leftover pizza sauce, sausage, and plenty of olives. 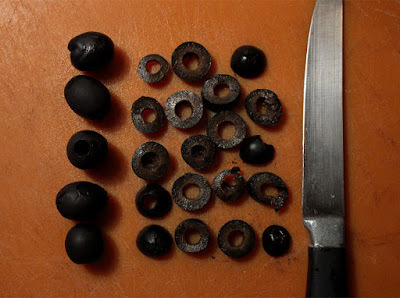 What's nice is being able to add as much sauce, olives and sausage as I wanted on each pizza. I had just enough mozzarella though, so could not go overboard with that. I find that may budget premade individual pizzas lacking, mainly they are skimpy with the meat and cheese. Using fresh pork sausage is so much tastier and I can crumble it into any size I like. 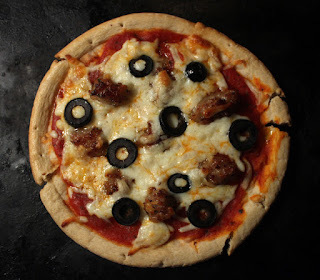 So on my Cheap$kate Dining Scale of 1 to 9, 9 being best, I give my Quick Italian Sausage and Olive Pizza made with Dollar Tree ingredients a strong 7! This pizza would could have been a perfect 9 if the pizza crust was better. 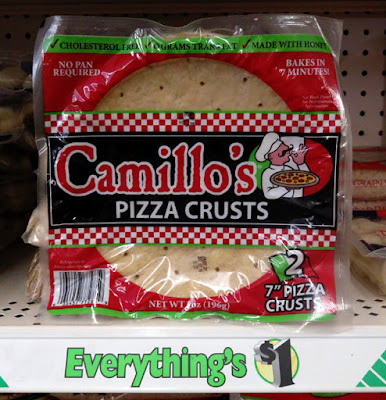 So while the ingredients were satisfactory, I'm still searching for a better pizza crust...for around a dollar. I like your recipe very much and have found the pizza crusts you used to be to my liking. 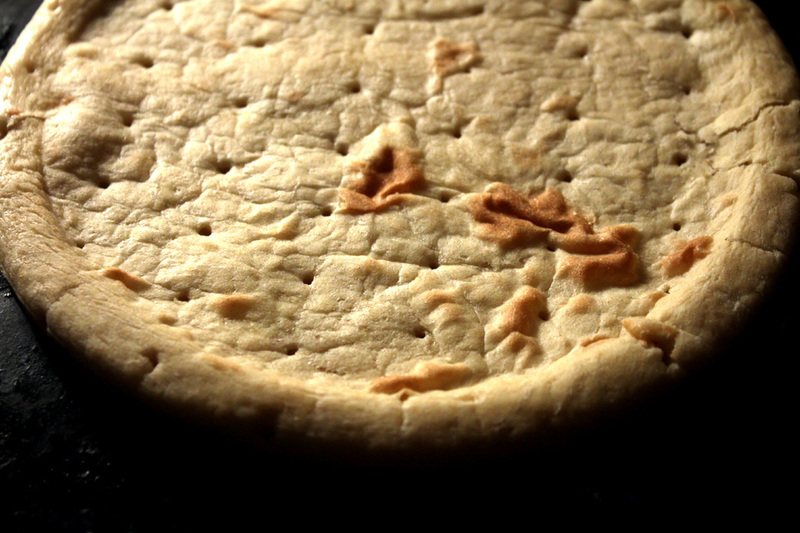 If you'd like a more bread-like crust, you might try a tube of Pillsbury Grands biscuits--the store-brand equivalent, of course--flattened to serve as the crust. The pizzas will be smaller, but will give the kind of center you like. 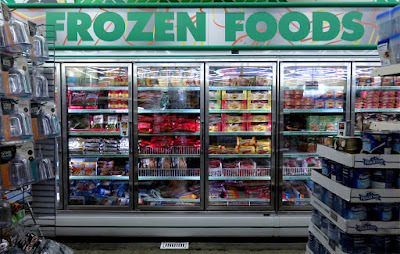 ....or you could just buy a frozen pizza, at any grocery store, 3 times the size for $5-6 bucks.